Bright Bank - Rare, magical, and steeped in history, sited high on a bluff taking advantage of extraordinary views of the Hudson River; Bright Bank will take your breath away. Nestled between the western backdrop of the Catskill Mountains and the Hudson River, surrounded by an abundance of serene acreage is where Joseph B. Sheffield (of famed J.B. Sheffield fine paper) originally built this gracious 13,000 square foot brick mansion in 1855. Now the stage is set for completion with modern infrastructure in place, and partially restored with magnificent original architectural details in tact awaiting your personal touch to transform this spectacular pallet into your forever dream. The sprawling property also has restored farm buildings, an artist studio, and caretaker cottage all on your own private bay with rights to restore a deep-water dock for mooring. 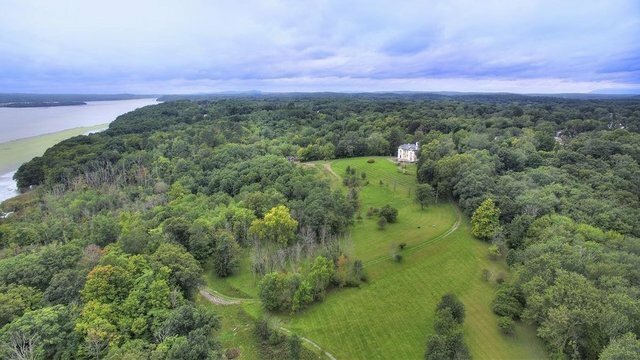 Experience a luxurious country lifestyle on this rare 137-riverfront acre magical property in the quaint historic village of Saugerties only 100 miles from New York City. Further details furnished upon request.